As clichés go, "third time's the charm" was never truer than in the case of Madonna. The future music megastar's third single became a worldwide hit after her previous two efforts had failed to take off. 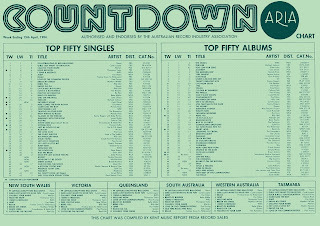 In Australia, she zoomed straight into the top 50 on her way to registering her first of 39 (to date) top 10 hits. Not bad for a song that didn't even have a proper music video. At the top of the ARIA chart, somewhere Madonna would be before the year was out, Nena held onto the number 1 spot a second week with "99 Luftballons/99 Red Balloons". The once-massive Australian band who'd recently been operating as The Sherbs reverted to their original name for this farewell single from an equally unsuccessful greatest hits set. While her TV career continued to blossom, British comic Tracey Ullman turned Kirsty MacColl's 1979 song into a UK and US top 10 smash. She had two other top 10 hits at home, but this was her only visit to the ARIA chart. Despite giving the duo another US top 10 hit, the second new track from Rock 'n Soul Part 1 peaked 70 places lower than "Say It Isn't So" in Australia. Previous single "Working With Fire And Steel" was still working its way towards the top 50 - we'll see it debut next week. This hastily released follow-up, the band's biggest UK hit, didn't quite get that far. I'm always surprised this fourth single by Hoodoo Gurus, released contemporaneously with debut album Stoneage Romeos, didn't do better. It was inspired by the departure of founding member Roddy Radalj. "Everybody" hadn't even been released in Australia. "Burning Up" had flopped. But, as in other parts of the world, "Holiday" was the song that turned Madonna from just another aspiring singer into a bona fide star in Australia. The final song chosen for inclusion on Madonna's debut self-titled album, "Holiday" had been written by two members of dance act Pure Energy, and previously been pitched to R&B singers Phyllis Hyman and Mary Wilson. When offered to Madonna, it slotted in perfectly with the pop/dance direction of the album. Released towards the end of 1983 in the US, it became a top 20 hit there and a top 10 single in the UK in early 1984. Championed by Countdown's Molly Meldrum, "Holiday" also took off locally, with a performance on Top Of The Pops used as a de facto music video. Bursting with positivity and energy, the song was only ever going to be massive and it remains a staple of her live repertoire, still standing up after all these years. From here, things took off incredibly quickly for Madonna, whose image - the hair, the bracelets, the dancer-meets-street urchin chic - was adopted by fans around the world, and whose follow-up hits (including a re-promoted "Burning Up") came thick and fast. From the future of pop music, we move now to two former chart-toppers who'd been knocking around the charts for a while collaborating on a remake of a song that dated back to the late 1950s. Originally recorded by Priscilla Bowman in 1958, and turned into a hit duet by its co-writer Brook Benton with Dinah Washington two years later as "A Rockin' Good Way (To Mess Around And Fall In Love)", the song sounded dated in 1984. Still, the its retro feel had sufficient admirers to ensure it gave Shakin' Stevens his biggest hit since 1982's "Oh Julie" and returned Bonnie Tyler to the top 50. There was nothing retro about this next song - the latest breakdancing-themed track to reach the top 50. Co-written by Jacques Morali (who also produced it) and Henri Belolo - the creative force behind Village People - "Street Dance" was a chart-topper across Europe. 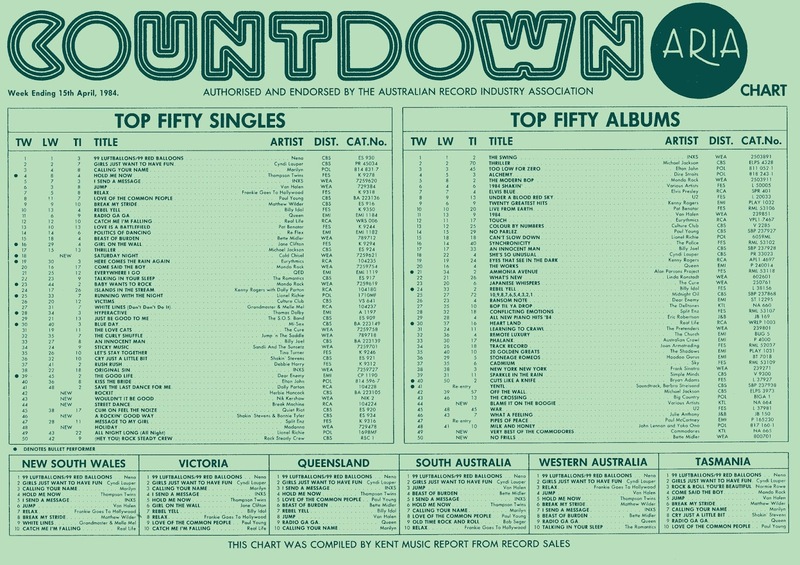 In Australia, the act fronted by radio DJ Keith Rogers had to settle for six weeks just outside the top 20 (three at number 23, three at number 21). Fun Madonna link: "Street Dance" was co-written and arranged by Fred Zarr (who can be heard playing keyboard on "Holiday"), and released in the US on Sire Records (also her label). Overshadowed somewhat by having the misfortune to debut in the same week as "Holiday", "Wouldn't It Be Good" marked the debut hit for British singer Nik Kershaw. Like Madonna, Nik had actually released music before "Wouldn't It Be Good" took off that would be given a second push by his record company down the track. In Nik's case, his debut single had been the original release of "I Won't Let The Sun Go Down On Me", which had peaked outside the UK top 40 in 1983 and, if it was released here at all at that stage, missed the ARIA top 100. But "Wouldn't It Be Good" was the song to get people to take notice - a moody synthpop track with an insanely catchy melody. A fancy music video featuring Nik wearing a glowing suit didn't hurt matters, and helped Nik attract attention in the US, courtesy of high rotation on MTV. This song certainly took its time to become a hit in Australia. Having originally charted in October 1983, "Rockit" peaked at a dismal number 72 before returning months later and ending up as a top 20 hit. The first charting single by the jazz legend came from his 35th album, Future Shock, which was his first to delve into electro and hip-hop. Apparently the first hit in the US to feature scratching, "Rockit" horrified jazz purists but delighted a larger number of fans of the emerging genres it straddled. Like "Wouldn't It Be Good", its Godley and Creme-directed music video made it popular at MTV and would end up winning five trophies at the inaugural MTV Video Music Awards in a few months' time. After a lengthy stay inside the top 50, "Rockit" finally fell out of the top 100 at the start of September, almost a year after its original release. Despite all the future stars and new musical trends debuting this week in 1984, far and away the biggest new single of the week was by a rock band that'd dominated the local scene over the past six years - and had just broken up. Debuting two weeks ahead of Cold Chisel's final (for the time being) album, Twentieth Century, "Saturday Night" was the start of a last hurrah for the band on the chart. The song, which was heard for years after on Hey Hey It's Saturday, became Cold Chisel's third biggest hit, following "Forever Now" (number 4 in 1982) and "Cheap Wine" (number 8 in 1980). With vocal duties shared by Jimmy Barnes and Ian Moss, the track was also memorable for its Richard Lowenstein-directed music video, which featured footage filmed around the inner city of Sydney, and at the Gay and Lesbian Mardi Gras parade. Next week: the debut of one of the year's biggest soundtrack singles, plus the latest top 50 hit from an album that'd now spent over 70 weeks on the chart. I wasn't aware of Tracey Ullman until catching, and then getting hooked on, Tracey Takes On, which used to air on ABC before rage started on Friday nights in '98. I didn't realise at first that also she sang this, which was used as the theme song. I didn't know 'Adult Education' until a rage retro month airing at the start of this decade. It's quite decent. 'Wishful Thinking' is nice, but a bit boring. I don't recall the Shakin' Stevens/Bonnie Tyler or Break Machine tracks at all. Interesting to see the clapper at the start of the Nik Kershaw video on Vevo. A great track; the mix of melancholy verses and upbeat chorus works well. 'Buffalo Gals' had scratching before 'Rock It' - unless 'Rock It' was a hit overseas before it (I suspect that claim is probably America-centric). Yes, you're probably right about the scratching claim. I listened to other hip-hop tracks to see if I could hear any scratching, but had forgotten about Malcolm McLaren!